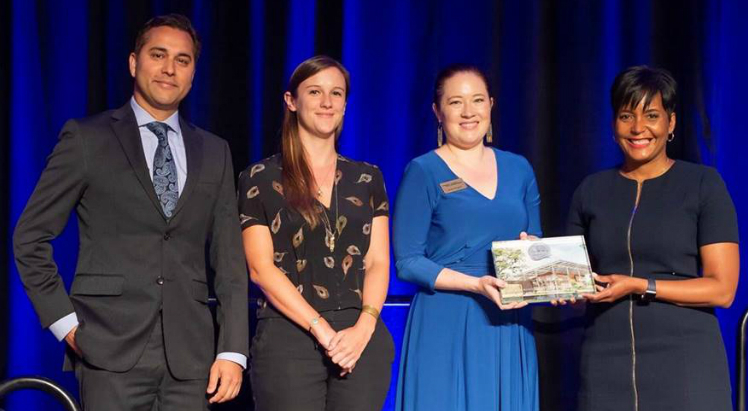 Atlanta Mayor Keisha Lance Bottoms was kind enough to be on hand last week when the Atlanta Better Buildings Challenge presented the Kendeda Building for Innovative Sustainable Design with its annual Game Changer Award. Even prior to completion, the project has already made a positive impact on campus and in the community. For example, lessons learned during the design and construction phases are being applied on other campus projects to increase efficiencies and building performance. The project team is also working with local vendors and subcontractors to lower the ecological and health impact of their business practices. When it opens, the Kendeda Building will serve as a “living laboratory” for teaching, learning, research, and outreach — not just demonstrating, but also expanding the possibilities for environmentally sustainable design in the future. As you may know, the Better Buildings Challenge is a public-private initiative led by the U.S. Energy Department under which cities, businesses, campuses and others commit to improving the energy efficiency of their buildings by at least 20 percent by 2020. With a focus on downtown, Midtown and Buckhead, the Atlanta iteration of the national program has enjoyed the highest participation level of any similar campaign in the country: Nearly 600 buildings with more than 100 million square feet of space have committed to the goal. From left to right, that’s Shan Arora, director of the Kendeda Building; Drew Cutright, program director in Administration and Finance at Georgia Tech; Anne Rogers, associate director of the Georgia Tech Office of Campus Sustainability; and Atlanta Mayor Keisha Lance Bottoms.